Think of it as an architectural reflection of the collaborative enterprise that it will foster. The School of Medicine’s new Health Sciences Facility III will be a world-class facility for biomedical research and integrate the research of our faculty investigators as never before. The School of Medicine’s new research building, Health Sciences Research Facility III (HSRF III) is setting a new standard of excellence in biomedical research, innovation and discovery. Faculty researchers began moving into the new facility in January and a grand opening will be held in September 2018. Working in HSRF III’s state-of-the art laboratories, with cutting edge genomic technology, faculty physicians and scientists are working together on breakthrough treatments for cancer, diabetes and heart disease - improving the health and well-being of Maryland citizens, and people around the world. 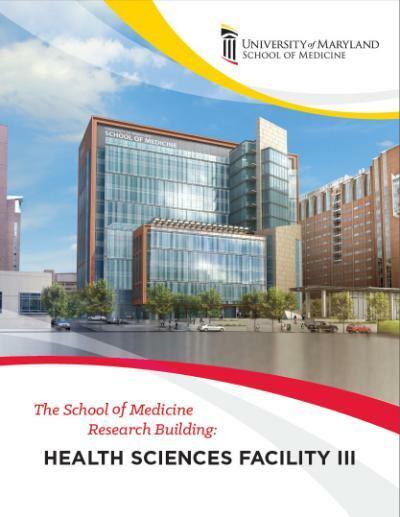 With 439,000 square feet, Health Sciences Research Facility III is the largest building ever constructed in the University System of Maryland. Rising above Baltimore Street on the University of Maryland, Baltimore campus, the new research building will provide room to grow for the School of Medicine’s life-saving research programs. A vitally needed economic engine, Health Sciences Research Facility Three will create hundreds of jobs in West Baltimore, stimulate economic growth, and generate revenue for the City and State.